Disposable gloves made of latex, nitrile, vinyl are often used to prevent products contamination in food, pharmaceutical or electronic industries. They will be handy for painting, engine repairing etc. Disposable gloves are usually supplied in 100 pieces packs. 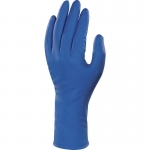 Vinyl disposable gloves are often priced lower comparing to gloves made of latex or nitrile. Latex (“medical”) gloves are characterized by very good elasticity and durability, but they can provoke allergic reactions and they are quickly destroyed by contacts with food fats and greases. Nitrile gloves are recommended for handling meat, fish, poultry, but they are quickly destroyed by contacts with acetone.